There are a couple main culprits that may cause streaming playback issues. We've found the following troubleshooting steps correct the vast majority of buffering or stuttering performance issues. Any option by itself may clear up the playback issues. If your video has stopped momentarily and this issue isn't occurring consistently, please click on the "Reload Video" button at the bottom left corner of your viewer. If a video playback issue consistently repeats - see below section. You may be having intermittent issue with your Internet connection. This solution will lock you onto the lowest video stream that may smooth out your video playback experience. 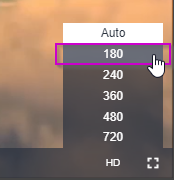 Select "180" to lock your video onto the least demanding video stream. Your Internet cache in your browser may need to be cleaned/cleared out. If you are unsure on how to clear your browser cache, an alternate and quicker option is to try switching to a different browser to continue viewing the program. If you're on Internet Explorer - try switching to view the program on Google Chrome or Firefox browser. Other popular browsers such as Opera are also compliant with program playback. Following this step resolves the vast majority of playback issues. ​If any video playback issue persists, please contact us at 877.602.9877 for additional troubleshooting!